Apple and Samsung have reached a landmark deal that will make iTunes movies and TV shows available via Samsung TVs from later this year. The agreement, which was announced ahead of this week’s CES event in Las Vegas, marks the first time that iTunes content will be available via smart TVs, with a new iTunes Movies and TV Shows app to debut on Samsung Smart TVs in more than 100 countries. Samsung Smart TVs in 190 countries will also start to support Apple’s AirPlay 2 standard, allowing users to share videos, photos, music and podcasts from their Apple devices to their TV. 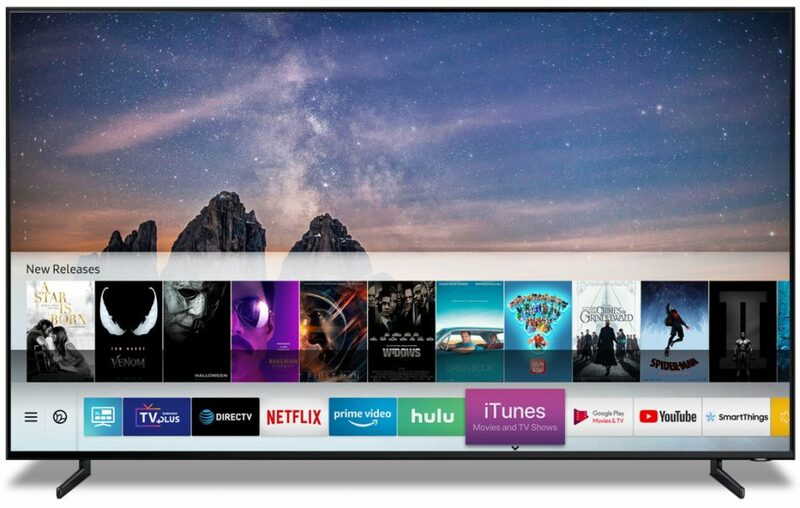 Support for iTunes and AirPlay will be available on 2019 models of Samsung Smart TV from this spring and will launch on 2018 models via a firmware upgrade. Previously iTunes has only been available on Apple devices and Windows PCs. The move will allow Samsung customers to access their existing iTunes library from their TV and buy or rent from a selection of hundreds of thousands of movies and TV episodes – including a large selection of 4K HDR movies. Samsung said that iTunes Movies and TV Shows will work seamlessly with its smart TV services, such as Universal Guide and Bixby voice control, to create a consistent experience across Samsung’s platform. “We pride ourselves on working with top industry leaders to deliver the widest range of content services to our Smart TV platform,” said Won-Jin Lee, executive vice president, service business of visual display at Samsung Electronics. Technology and media analyst, Paolo Pecatore, described the deal as a “smart strategic move for both companies” – one that highlights the importance of working together to achieve scale. “Samsung is better placed than rivals to act as an aggregator given its broad distribution reach. For this reason, it will provide a much-needed services revenue boost for Apple,” said Pescatore. Apple has made a bigger push into the TV hardware space in the past year, providing its Apple TV box to a number of operators via deals with companies like Free in France, Salt in Switzerland and Charter Communications in the US. In June 2017 Apple also started to move into original programming by hiring Sony Pictures Television’s co-presidents Jamie Erlicht and Zack Van Amburg to lead its efforts in this area. Since then it has appointed former Channel 4 content chief Jay Hunt as European creative director of worldwide video and BBC Films veteran Joe Oppenheimer as a creative executive for its international team. Apple also struck a multiyear deal with Oprah Winfrey.